The Duke and Duchess of Cambridge made a surprise appearance at the early morning service for Anzac Day at the Australian War Memorial. Kate wore her black Temperley London coat and black gloves. Later in the morning, Kate and William were at the ANZAC Day march at the Australian War Memorial. The Duchess was dressed in a Michael Kors coat, wearing a fascinator by Jonathan Howard. Kate and William place a poppy flower into the World War I Wall of Remembrance. A gorgeous photo of the poppy flowers on the wall of remembrance. Kate smiles on her last day in Australia. A few hours later, it's time to say goodbye! Annnd commence all of the hilarious faces of our precious Prince George. The Australian Prime Minister says goodbye to the royal family. "Who are all those people with cameras?" Kate smiles as she, William and George board their plane home. "Wait, what's going on over there? Can we go over there?" And they're off! It was a long tour, but we think they pulled it off magnificently. Major plus along the way: little baby George. That's a wrap! The royal tour has officially come to an end and Prince George, Kate and William are en route back to London. The Duke and Duchess attended a commemorative service for ANZAC day in the morning, to honor fallen war heroes from Australia and New Zealand. They laid a wreath on the war memorial, and then added poppies to the Wall of Remembrance. The Duchess was dressed in a Michael Kors coat, navy heels and a fascinator by Australia milliner Jonathan Howard. Both she and William had red poppy pins. After the services were over, Prince William and Duchess Kate scooped up baby George to head home and of course, he made countless adorable faces (and flashed his baby teeth!) as they said their goodbyes. The little Prince was dressed in a red sweater, red and white striped shorts, and his navy blue shoes for the flight home. Too cute! 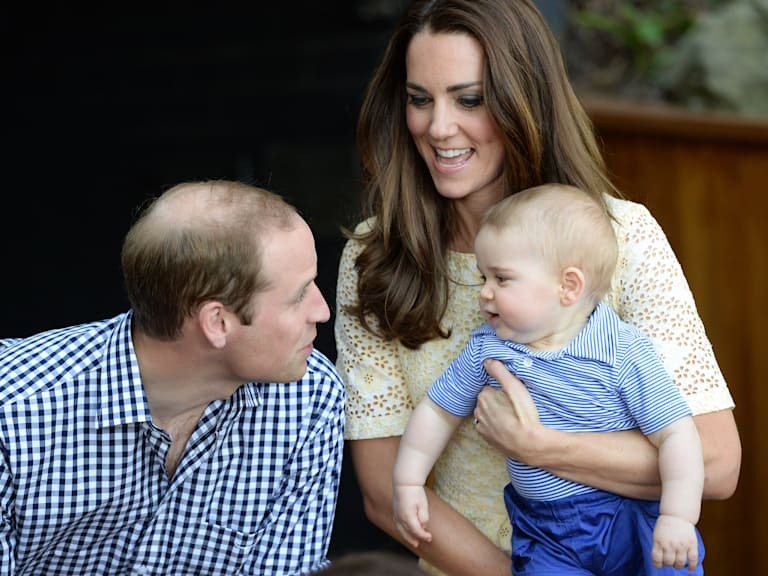 It's likely the last time we'll see George for a while -- we're hoping he makes an appearance at Trooping the Colour in a couple months, but it's definitely likely we'll see him on his first birthday in July. All to be determined! William and Kate have reportedly said they'd like some private time as a family now -- and rightfully so -- after such a long tour. Their 3rd wedding anniversary is on the 29th, so we're sure they'll have a nice, quiet celebration just for themselves. Click through the gallery above to see the royal sendoff.